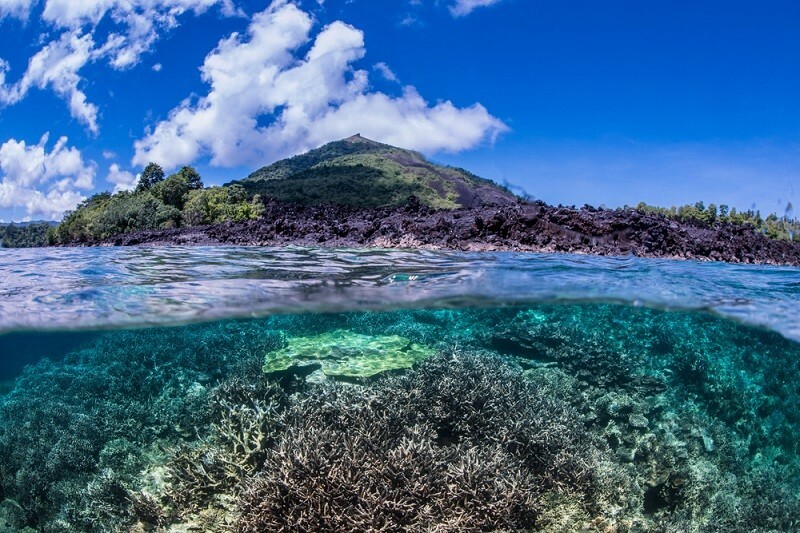 The Maritime Affairs and Fisheries Ministry, supported by USAID, have launched 226,280-hectare conservation areas to protect small islands in North Maluku. The cooperation aims to secure marine productivity that benefits the locals. Indonesia possesses more than 10,000 small islands. In spite of minor inhabitants, these islets are important for their natural resources, leisure activities, even our national defense. However, these small islands are currently under threat. NASA’s long-term satellite observations from 1993 to 2018 showed an increase in global sea level of about 90 milimeters, with 3.3 mm on average per year. Following significant change to the world’s climate, the increasing ocean height would submerge small islands, particularly the coral, atoll and alluvium islands. To address this problem, conserving the coastal ecosystem by introducing ecological engineering on mangrove, coral reef and seagrass is crucial. Most of the small islands are located in remote areas, which turn into an added value to the sustainability of engineering efforts. However, the risk of environmental degradation remains high due to the beauty of the coast and the ecosystem diversity, which has potential to be explored as a tourist destination. Excessive land conversion is feared to damage the ecosystem, resulting in high exposure to sea level rise. Ecological engineering aims to reduce anthropogenic impacts while restoring the ecosystem. It has the ability to fix the physical environment, which includes lowering sedimentation and resisting waves. To set up ecological engineering as part of the adaptation strategy, we need to consider the characteristics of landform of these small islands. There are the alluvium islands like Bintuni Bay Papua, which was formed on flat coastal plain or estuaries of large rivers dominated by nipa palm and mangroves. The latter plays a key role as an adapting strategy in maintaining ecological function. In addition, coral reef and seagrass are able to serve as coastal protection if the environmental factors to the growth of the ecosystem are available. Meanwhile, for coral islands such as Raja Ampat in Papua, Thousand Islands in Jakarta, Bontosua in South Sulawesi, Bunaken in North Sulawesi, Derawan in East Kalimantan, Karimunjawa in Central Java, Pengalap Riau as well as atoll islands as found in Takabonerate in South Sulawesi, very popular among travelers, that originate from coral fragments and small rocks deposit, covered by a typical feature of white sand and surrounded by coral reef, along with seagrass, are also important ecosystems to grow. Research published in Nature Geoscience2012 revealed the greatest potential of seagrass in absorbing carbon, which is two times greater than rainforest (around 30,000 tons per square kilometer). Considering its vital role, the cultivation of seagrass along the coastal areas is highly recommended. Since the islands are very small, the role of mangrove is less optimal, especially for atoll islands with limited areas. In addition to seagrass cultivation, coral reef status is important to monitor, and immediate rehabilitation is conducted if the damage is found. Artificial transplantation is carried out as healthy reef could reduce wave energy, slowing sea level rise. In recent years, mangrove habitats have been lost due to human influence. The Center for International Forestry Research (CIFOR), based on the 2018 data, revealed around 52,000 hectares are lost annually. The remains still have to deal with natural threats. As they struggle to counter sea level rise, adaptation is required, and a vertical adjustment is given in their growth. A paper published by scientist Ken Krauss and colleagues in 2014 presents a comprehensive study on mangrove's resistance associated with sea level rise, how they contribute to increasing soil elevation as well as to provide nutrients on the ground, how the root processes grow upward, or how they could survive in inundation by storing sufficient mineral to feed them. Mangrove persistence on the changes of landform/landscape, hydrology and climate factors were also tested. Such valuable findings could be implemented on small islands. Restoration areas could serve as field laboratories to examine mangrove resilience. Such ecological engineering, including coral reef and seagrass treatments, strengthen our adapting strategies in facing sea level rise. On the other hand, a concept of community marine nursery services is essential to endorse. Ecosystem services are facilitated through marine nursery by concentrating on mangrove forest succession. It is believed that rich of fresh, brackish to saltwater biodiversity as well as marine, bird and endemic species are stored and depend on such hydrosere system to sustain their life. Since seagrass and coral reef are prominent in carbon sink and marine food web, seagrass farming and reef also become parts of the nursery program. Community awareness is highly encouraged by performing active participation by means of extension, dissemination and education as well as coastal conservation action as one small adaptation step towards giant mitigation of greenhouse gasses emission. These adaptation and mitigation options would inspire the development of community resilience to global warming. By involving the community, integrated management toward a sustainable ecosystem of small islands to overcome the ongoing sea level rise is able to achieve in the present and future.